Performers include: Lynne Thigpen, Noel MacNeal, Vicki Eibner, Tyler Bunch, Peter Linz, Tara Mooney, and James J. Kroupa. A children’s series that stars the lovable and affable seven-foot tall Bear (Noel MacNeal). Bear speaks to viewers directly as if they were close friends and asks them to join him as he goes about his day, helping his puppet housemate friends learn about the world. 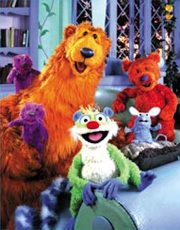 Living in the house are excitable lemur Treelo (Tyler Bunch), headstrong mouse Tutter (Peter Linz), peppy otter twins Pip and Pop (Peter Linz and Tyler Bunch) and imaginative little bear cub Ojo (Vicki Eibner). Each episode comes to a close as bear recounts the day with Luna (Lynne Thigpen), the wise moon.